Finally back to a Seven on Saturday post! Sorry about missing a few weeks. We are so excited to share these 7 items with you today as they are all really good, easy to wear Spring pieces. All of these could be worn to work but are still perfect for the weekend! This gingham ruffle sleeve tank top is adorable! It also comes in white and a stripe and is under $20! Here is another ruffle sleeve tank that has a slightly bigger ruffle and comes in 3 solid colors. Betsy just ordered this gingham dress for an upcoming event! Isn't it stunning!!? The layers of ruffles are too cute. 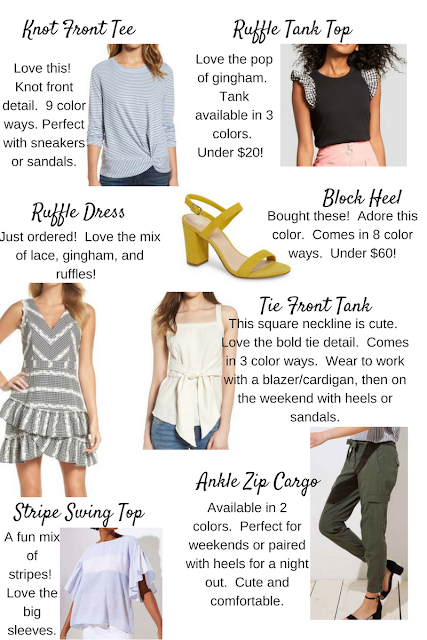 One of our favorite stores has a bunch of new arrivals and we are loving them all! (I'll be sharing more about these on Instagram and linking them above under the SHOP tab.) This mixed stripe swing top immediately caught my eye! !